More on the Korean beef protests, which continue. The Western news sites I’ve checked, mainly the BBC and CNN, mention President Lee’s conciliatory statement about the controversy. The BBC says, “Last week, Mr Lee issued a public apology, saying he had failed to appreciate the depth of public fear.” But it doesn’t mention what two of my Korean friends confirmed independently, that Lee’s first public reaction had been derisive, telling Koreans that if they were afraid to, they shouldn’t eat the meat. President Lee, I’m told, was a corporate CEO before he became Mayor of Seoul and then President of South Korea, and he views citizens as employees. The BBC’s pictures of the protests are also much less inflammatory than those at OhMyNews (the source of the the photo above). This link keeps adding more pictures, so even if you’ve already looked at it, you might want to check it again. You don’t have to be able to read the accompanying Korean text – I can’t – but the pictures speak for themselves. (The bottom picture, by the way, is of a policeman who was hurt in the struggle, but injured protesters outnumber injured cops 2 to 1. Lenin's Tomb has some relevant remarks from another context.) I showed this page last night to one of my Korean friends, who can read the text, and he was furious. He’s old enough to remember the dictatorship and the popular movement that overturned it. 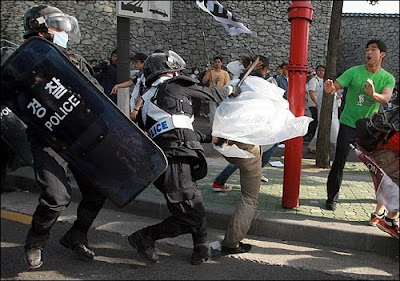 Water cannons and cops beating people are a blast from a past that most Koreans hoped was long gone. President Lee Myung-bak will replace some Cabinet ministers and presidential secretaries possibly this week as part of efforts to ease the escalating public anger over the resumption of U.S. beef imports, ruling camp officials said yesterday. "The president is taking the current situation seriously," said a presidential aide. "He is doing his utmost to figure out what the fundamental problems are. He will then put forward the answers." An official from the ruling Grand National Party said there is the possibility of four or five Cabinet members and presidential secretaries being replaced. Among them said to be most likely dismissed are Agriculture Minister Chung Woon-chun, Health and Welfare Minister Kim Soung-yee and Education Minister Kim Doh-yeon. The reshuffle is expected to be included in a set of measures Lee plans to announce to win back the hearts of angry citizens who have turned their backs on his administration over the decision to resume U.S. beef imports. Unfortunately, I can’t link to individual stories at the Korea Herald, which is why I’m quoting this one at some length. Lee's response sounds like typical damage control. I doubt, though, that throwing a few ministers and secretaries to the jaws of the new Zeitgeist will help President Lee: Koreans know his responsibility for these moves too well. President Lee offered a public apology, holding himself solely responsible for all the mistakes his administration had made about U.S. beef imports. By doing so, he apparently wanted to shield himself from pressure to dismiss his agriculture minister and the other officials who conducted the negotiations with the United States. Not many options are available to Lee now that what started as a protest against the importation of unhealthful beef is threatening to become an antigovernment campaign. The Lee administration has been considering presidential amnesty for protesters convicted of misdemeanors as a way out of the predicament. But that would prove to be too little to turn the tide. The opposition parties will do well to discontinue street politics immediately and start talks on the operation of the new legislature soon. Otherwise, they will simply be seen to be inciting those disgruntled about the negotiations on U.S. beef imports for their own political gain. Don’t you just love the blind passive voice? “They will simply be seen …” Seen by whom? Of course, exploiting the ruling party’s screw-ups for political gain is as hallowed a part of politics as “dialogue and compromise.” President Lee is also trying to use the tactics of image and perception that are standard operating procedure in the US: If the public opposes a policy, tell them they misunderstand it; try to change the government's image instead of its policies, which are sacrosanct. The kind of pro-corporate “free trade” policies Lee has pursued so willingly are rarely enacted democratically. At best, they’re worked out in backroom negotiations and sprung as a fait accompli on the public. It is Lee’s government that, like most today (including my own), needs some lessons in representative democracy, and it appears that it will get them.